Anyone who has seen the classic film The Godfather most certainly remembers it. Its iconic scenes and one-liners are imbedded in popular culture and even the American language since its release in 1972. 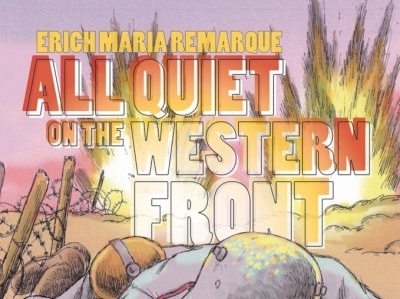 Oddly, despite the obvious drawing power of the film, until recently there have been no games based on it. Designers afraid to cross the Don, perhaps? As the film passed the 40-year mark, though, a few designers have drawn on Coppola’s masterpiece. Most recently, Eric Lang has tried his hand. But is this an offer that can’t be refused? Or are you better off just taking the cannoli? Summary: The Godfather is played over four “acts” that are vaguely themed by the plot of the film. But in truth, the play of the game has very little to do with the events depicted in the movie. Instead, let’s say that the action is “inspired” by the kind of things that the characters might have done while they were off screen. Each act begins by opening a new business for the players—leaders of New York City gangs—to “shake down” for fun and profit. Then the players take turns placing their characters—family members or thugs—on various locations in the city. This is classic worker-placement stuff: You gain goodies based on the location you plop your worker down on. 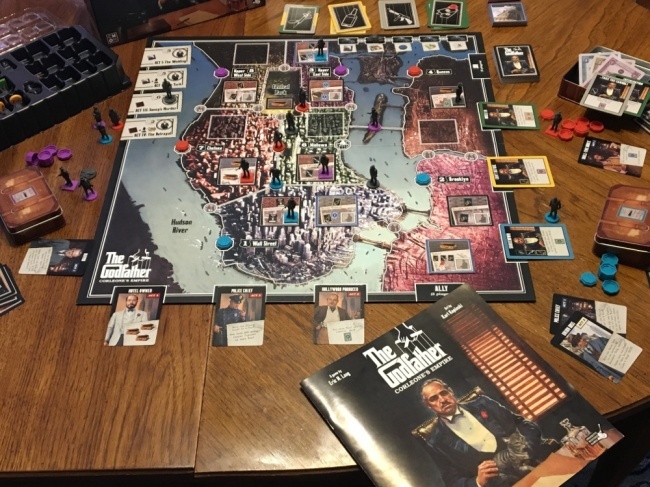 It’s what you do with the stuff that’s interesting: Instead of placing a worker, a player can complete a “job” for Don Corleone by paying the required mix of booze, guns, and blood money. Jobs pay out money and grant a one-use power, up to the ever-popular “gunning down” of a rival gang member who then must “swim with the fishes” in the Hudson River for the rest of the act. The goal of all this money-making is to secret your funds in your suitcase, as only money here counts at the end of the game. The act closes with a struggle for control of the seven “turfs” in the city, using an area control mechanism where the player who deployed the most workers in a turf gets control, earning privileges as long as they can keep it and possibly cash at the end of the game. Then allies can be bought in auction using money from the suitcases. 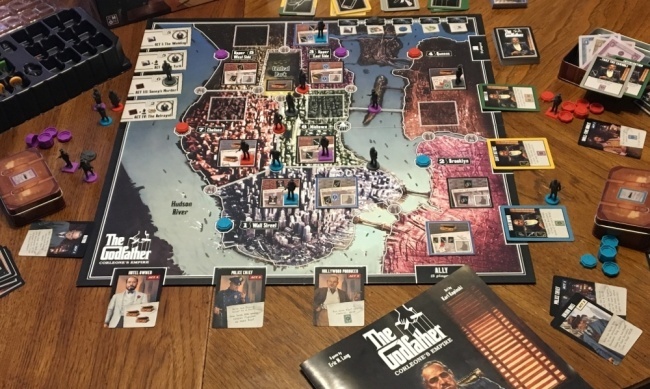 Originality: The Godfather mixes a number of familiar game mechanisms together in an interesting way: worker placement, area control, “stick it to your neighbor” card play, hidden and public individual player goals in the form of job cards, an auction. Nothing really revolutionary here. But credit to Lang: it is put together very nicely and, thanks to the variable game board (due to the random new business openings every act), in a way that offers a lot of replayability. But don’t be lulled into a false sense of calm. This is not a family-friendly “Euro” worker placement game. This is bare-knuckled and mean. This is a mob war, and any player who isn’t willing to get their hands dirty is going to find themselves rubbed out pretty quickly. Presentation: This really is a real “Cadillac” of a game. The box is big—it stands 4 inches tall when it’s lying flat. That’s to give enough space for the 36 sculpted plastic miniatures, all crafted with the usual high quality we have come to expect from the company that once had “cool mini” as part of its name. If that wasn’t luxurious enough, each player gets their own miniature suitcase: actually a hinged metal box just the right size to stash some ill-gotten loot. Everything in the game, from the board to the cards, even the rulebook, are all lavishly illustrated. The character portraits by Karl Kopinski exquisitely capture the actors of the film, while the graphic treatment on all of the components evoke the style of the movie’s famous logo. The presentation of this game simply oozes theme. Quality: CMON didn’t skimp in this department either. The plastic minis are excellent, and detailed enough that they are worthy of a paint job for those inclined. The metal suitcases are a real treat: packing away your criminal profits is a much more satisfying tactile experience than simply stacking them face down. The rulebook is full color, with lots of illustrations and plenty of examples. Few questions come up after a careful read, and it’s easy to find answers to questions during play. 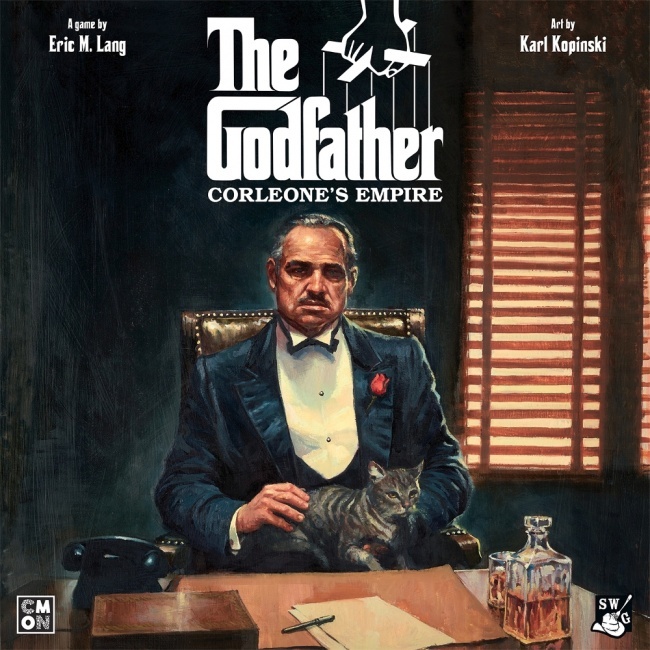 Marketability: Eric Lang and CMON have both developed a pretty loyal following by producing good quality games with excellent components, and The Godfather definitely continues that trend. But, $80 is a lot of money for what is, at heart, another worker placement game. This one has enough tweaks to make it a worthy addition to the genre for sure, and any gamer who is also a fan of the film is certainly going to want to pick this one up. Overall: The Godfather is a very well-crafted game. It has superb balance (every game I’ve played so far has been decided by a single point), and it is an unexpectedly tight two-player game. The variable businesses and allies available (only about half are used each game) keeps gameplay fresh by offering new challenges almost every time you play, and the multiple routes to scoring (completing jobs, controlling turf, and gathering money) means that this game has a lot of strategic depth. Yet, some players will find this one a bit harsh, and luck can play a significant factor. 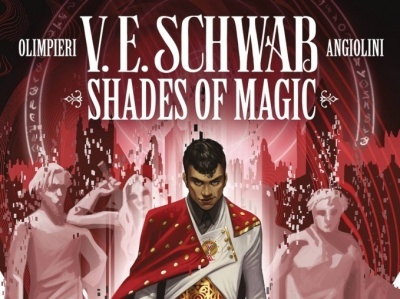 Over-the-top production value leads to a slightly high price for this otherwise excellent creation. So take the game and the cannoli. I can easily give this one 4 out of 5.